This unit is an active person's first-rate accommodation. These units have a large rear door perfect for easily moving kayaks, bikes, or other equipment in and out of the unit. The Basecamp model only weighs 2600lbs and is priced to clear. Full price includes shipping , environmental fees, service fees and document fees. Price does not include tents. Roll with the best! Airstream has been inspiring adventures and making memories since 1931. If you’re looking for a unique buying experience, talk to us and see why our approach and our units set us apart from other dealers. Learn how your new RV works with one of our highly certified RV technicians. Stay in our fully serviced guest camp spots until you are confident operating your new unit. Call our expert sales team; we’re ready to assist you. 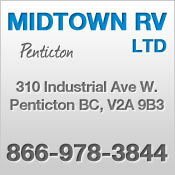 Serving Western Canada, Midtown RV Ltd., located at 310 Industrial Avenue West in PENTICTON, BC, is your premier retailer of new and pre-owned Luxury RV's. Our dedicated sales staff and top-trained technicians are here to make you feel like part of our family, and make your RV shopping experience fun and easy. Please utilize our various online resources and allow our excellent network of people to put you in your ideal vehicle today!